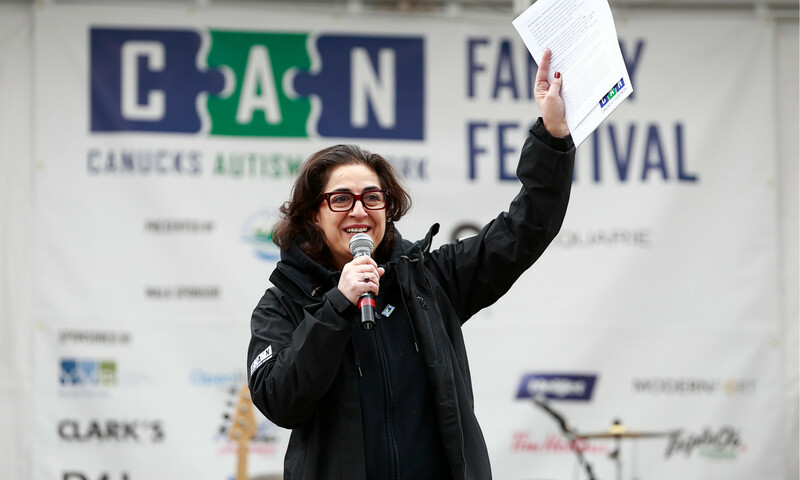 Over ten years ago, Katy Harandi gathered around a kitchen table with Vancouver Canucks Co-owners Paolo and Clara Aquilini and envisioned an organization that could provide recreational opportunities and a community of support for families living with autism. As parents of children with autism, Katy, Paolo and Clara shared an understanding for the struggles associated with an autism diagnosis. It was with this desire to support other families living with autism that Canucks Autism Network (CAN) was formed. On March 8, International Women Day, we recognize the decade of strong leadership that our invaluable President and CEO, Katy Harandi, has provided to our growing organization. Her spirit, compassion and infectious “I CAN” attitude has inspired a team of hundreds to create a space where every individual with autism can be understood, accepted and supported. But before leading CAN, Katy’s commitment to those with autism began at home. Motivated to create a better life for her daughter with autism, she researched the field extensively, investigating a wide range of treatments for autism. And in order to supervise her daughter’s at-home support, she underwent countless hours of training from specialists and therapists. Beyond her personal motivation to better understand autism, Katy was driven to create positive change in the lives of other families with autism, as well. With an MBA from UBC Sauder and a background in computer science, Katy’s acumen and solution-driven mindset have propelled CAN since day one. After overseeing the process of becoming a non-profit society and registered charity, Katy and the Aquilinis set about obtaining funding from the Canucks for Kids Fund. 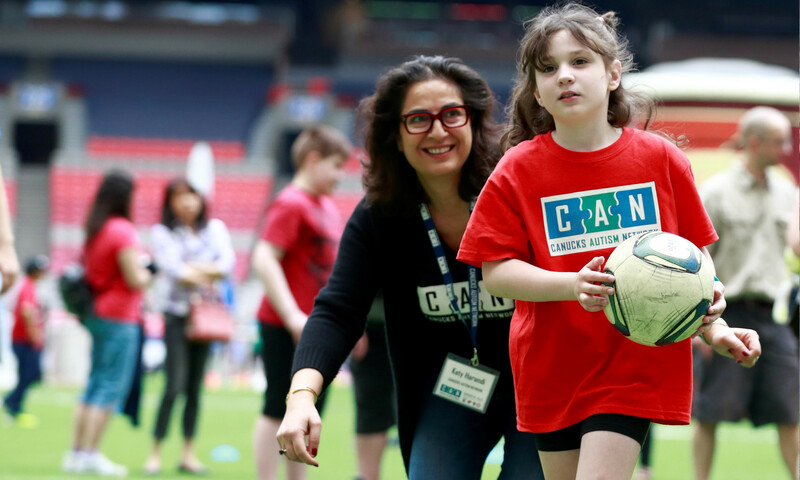 In its inaugural year, CAN offered one soccer program at what was then GM Place and an autism awareness curriculum for elementary schools in the Lower Mainland. From 2008-11, Katy served as CAN’s Chair of the Board, guiding the organization in its formative years as a small, grassroots charity. By 2012, CAN developed the capacity to fill over 2,700 annual program spots in weekly sports lessons, day camps, overnight camps and family events. But during a critical time in CAN’s 10-year history, we were faced with a vacant Executive Director position. Katy was selected to assume the position of CEO on an interim basis. What many may not know is that for one year, Katy donated her time in this executive position. While the Board searched for a permanent replacement, Katy represented an extreme rarity in the executive world – a volunteer CEO. Needless to say, her selflessness and unwavering commitment is what inevitably made her the appropriate choice to assume the permanent position of President and CEO. But regardless of her title – whether it be Chair of the Board, President, CEO or volunteer – it is Katy’s steadfast leadership since our inaugural year that has allowed CAN to influence the thousands of families with autism that benefit from our programs today. Outside of CAN, Katy also serves as President of PALS Autism Society, another non-profit in Vancouver that provides school and adult programs for individuals with autism. It should come as no surprise that she has been a nominee for the YWCA Women of Distinction Award and a recipient of the Queen’s Diamond Jubilee Medal for service to Canada. This International Women’s Day, we celebrate the countless women like Katy who have dedicated their time and efforts to individuals and families living with autism across BC. They are on our board and in our office, guiding and coordinating our efforts. They are in our programs, delivering support in gyms, arenas, pools and fields. They are at home, providing unconditional love and care.